Are you looking for a door and window contractor to build a sunroom for your home? Whether you have an open porch that you’d like to convert into a sunroom or need a screen room built onto your home, LYF Construction can help. For over 16 years, LYF Construction has provided quality window and door services to area homeowners and businesses. We specialize in the construction of three season porches, screen rooms and sunrooms. Call (832) 304-6764 today for a free estimate. 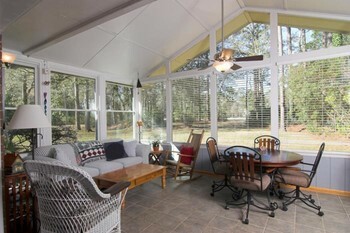 Sunrooms serve multiple purposes for area residents and increase pleasure and enjoyment in their living environments. Three season porches and sun rooms are often used as reading rooms, family game rooms and even offices by LYF Construction customers. They provide lots of natural sunlight and are the perfect spot for growing indoor plants. Since 2003, LYF Construction has been a local favorite in designing and building sunrooms as home additions or conversions. We can start from scratch or work with your existing plans to create the ideal sunroom solution you have in mind. Whether you are looking for more living space to accommodate a growing family, or just need a room in your home you can claim as your own, LYF Construction can turn your plans into the sunroom you’ve envisioned. Partnering with LYF Construction for your sunroom renovation project makes sense. We’ve been in the windows and doors industry for over 16 years and are always happy to share our knowledge, ideas and passion for creating functional, attractive spaces. 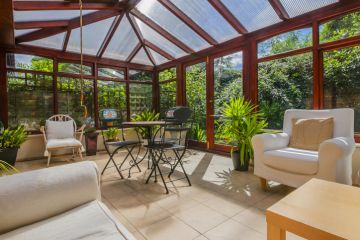 Enhance the enjoyment you receive from your home investment by having LYF Construction convert or install a sunroom. Call today for a free consultation. Looking to add an extension to your home? Get the best of both worlds, sitting bug free indoors, while enjoying the light and sounds of the outdoors. Screen rooms allow you to enjoy the outdoors without having to worry about the pesky mosquitoes, rain, or intensity of the full sun. LYF Construction specializes in converting patios and porches into screen rooms or building a new one from scratch. When you're searching for a reliable contractor for your sun room or screen room project, LYF Construction is a great choice. We've been a local, trusted contractor since 2003. Give us a call for your free estimate on your "screen" project.